Lewis Bryant Jr. sporting his best “Bat Wear” when going through mail from his supporters. 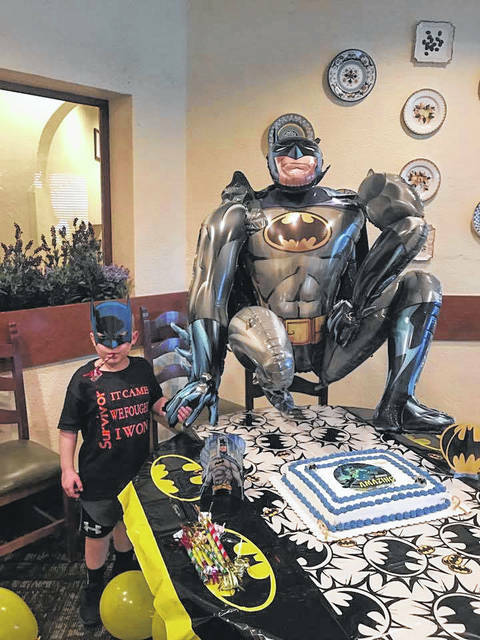 Holdyn Keefer sporting his best “Bat Wear” on the day he celebrated the end of his chemotherapy treatment. The Point Pleasant Intermediate School Point Black basketball team will be presented a trophy with a basketball topper holding the signatures of Marshall University’s basketball players as well as the signatures of two local heroes, Lewis Bryant Jr. and Holdyn Keefer. POINT PLEASANT — This season’s championship winners for biddy league basketball will be receiving a special and unique trophy. During the intermission between games of this Saturday’s home Point Pleasant Junior Varsity and Varsity Boys Basketball games, the fifth and sixth grade youth league basketball championship winners, the Point Pleasant Intermediate School (PPIS) Point Black basketball team, will be presented a trophy with a basketball topper holding the signatures of Marshall University’s basketball team, as well as the signatures of two local heroes, Lewis Bryant Jr. and Holdyn Keefer. The junior varsity game will begin at 5:45 p.m.
Local volunteer Dave Morgan’s plan is to use this trophy as a token of awareness for childhood cancer, in honor of Bryant and Keefer as both young boys have had a cancer diagnosis and experienced the battle that follows. Also, both boys were basketball players earlier in their lives. Morgan wants this trophy to be passed on throughout the years to the biddy league basketball championship winners. He has paid to have each year’s champion’s team name inscribed on the basketball topper for the next 10 years. “This will be something that can be cherished and used for years to come,” Morgan said. Last year Morgan attended a Big Green Foundation dinner with his brother and sat with Marshall University’s coaches and athletic director. Later that year, Marshall and West Virginia University (WVU) played a game against one another and Morgan came up with the idea to have a basketball signed with either one or both of the teams signatures to be given in honor of Bryant and Keefer to the biddy league basketball champions. 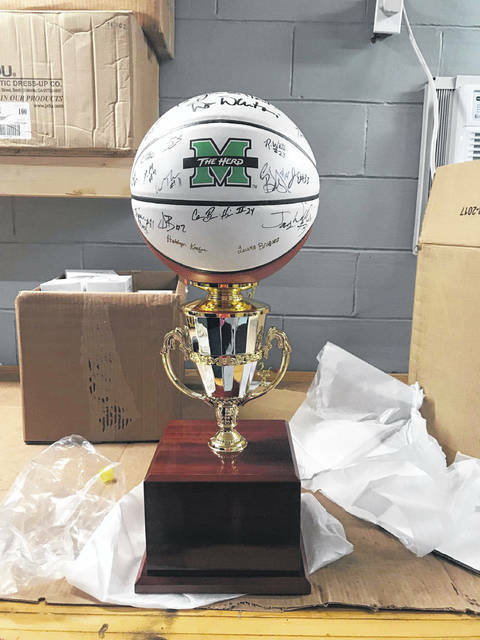 Morgan reached out to various individuals to assist him with getting the Marshall University’s basketball players names who played in the Marshall/WVU game and then reached out to Sexton’s Creations to have Bryant’s and Keefer’s names inscribed on the basketball. MU alumnus Jacob Hill will be presenting the trophy to the PPIS Point Black basketball team as he is in charge of the local chapter for the Big Green Foundation, explained Morgan. 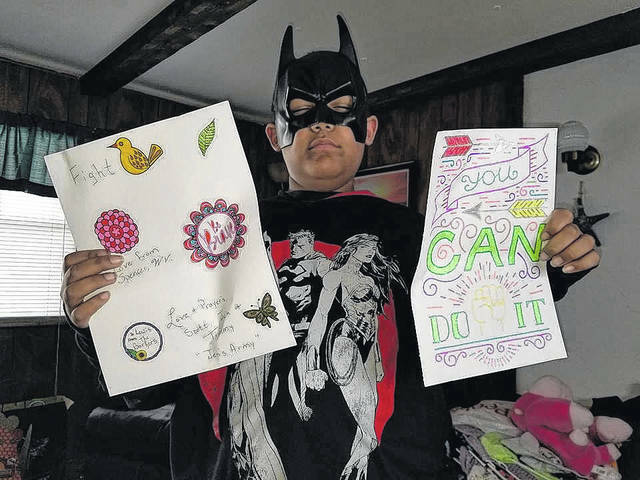 In looking at future plans, Morgan would like to hold an annual tournament called “Battle Against Childhood Disease” for area biddy league basketball teams. “This could be an excellent fundraiser to help underprivileged kids have an opportunity to play and if successful enough to create a supplemental fund in the future when the need may arise for sick children,” said Morgan.